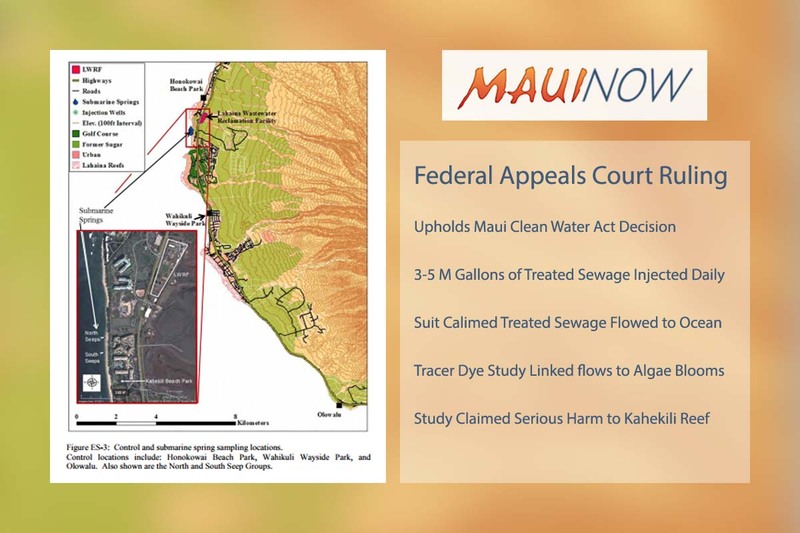 A key Clean Water Act ruling was reaffirmed as the US Court of Appeals for the Ninth Circuit rejected the County of Maui's petition for the full court to rehear an appeals panel's February ruling. Maui Now graphic. PC: Map courtesy Lahaina Tracer Dye Study. The panel found that the County has been violating the US Clean Water Act since its Lahaina Wastewater Reclamation Facility was first put into operation in the early 1980s. County officials tell Maui Now that they will appeal the ruling to the US Supreme Court. Maui Mayor Alan Arakawa addressed the issue of injection wells in his State of the County address in February saying the County was going to transition to zero waste of recycled wastewater by way of irrigation. In Lahaina, plans call for the use of high-level reservoirs that can pump and store recycled water to ensure redistribution and reuse. The mayor said that process can be accomplished in about a year. (An excerpt from the mayor's address relating to this topic is posted at the bottom of this story). According to the environmental law firm Earthjustice, the Lahaina facility, which serves West Maui, injects 3 million to 5 million gallons of treated sewage into groundwater each day. In 2011, an EPA-funded study used tracer dye to show conclusively that the Lahaina sewage flows with the groundwater into near-shore waters off Kahekili Beach, where it has been linked to algae blooms that smother the coral reefs and other degradation of this unique marine ecosystem. 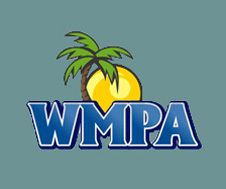 Noting that the County admitted it would need a CWA permit "to dispose of pollutants directly into the Pacific Ocean" through an ocean outfall, the panel held that it "would make a mockery of the CWA's protections" to allow the County to do "indirectly that which it cannot do directly," according to Earthjustice. Industry groups and 18 conservative state attorneys general had argued for the rehearing, making this decision an important affirmation of Clean Water Act protections across the nation. Four Maui community groups represented by Earthjustice — Hawai'i Wildlife Fund, Sierra Club-Maui Group, Surfrider Foundation and West Maui Preservation Association — sued the County in 2012, seeking to protect the sensitive coral reefs at Kahekili, as well as public users of the popular beach park, from harmful pollution. In 2017, the US Geological Survey, the State of Hawai'i's Division of Aquatic Resources, and other experts published a peer-reviewed study documenting the ongoing harm to the reef at Kahekili associated with the Lahaina facility's discharges to the ocean. "We're pleased the Ninth Circuit rejected this attempt by polluting industries to do an end run around the Clean Water Act," said Earthjustice staff attorney David Henkin. "When Congress passed this landmark law to protect our nation's waters, it did not create a loophole for Maui County to pollute the Pacific Ocean by using the groundwater underneath the Lahaina facility as a sewer." 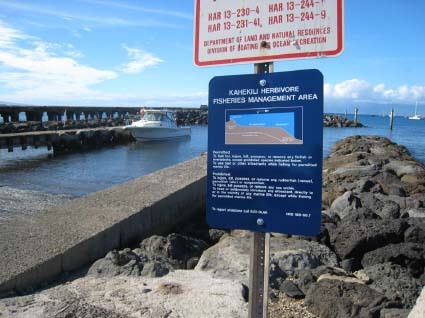 In 2015, the County agreed that, if it lost its appeal, it would invest $2.5 million in infrastructure upgrades to allow treated effluent from the Lahaina facility to be reused for irrigation, rather than dumped into the ocean. To date, Maui County has authorized expenditures of over $3.5 million for private lawyers to litigate this case, according to Earthjustice. "The Department of Environmental Management is looking at possible alternatives to reuse our recycled wastewater effluent so that we no longer have to waste this valuable resource. Maui County's recycled water is clean enough to be used to irrigate landscape, agriculture, forest reserves, bio-crops and much more. "This is possible because our wastewater goes through a thorough treatment process. Our R-1 treatment includes membrane filtration, ultraviolet disinfection, and chlorination. "In Maui County, we use recycled water at more locations than any other island, including Kaanapali, Maui Nui, Pukalani and Manele golf courses, as well as at Kihei Elementary and Lokelani Intermediate schools. There are also a number of parks, bikeways, resorts, condominiums, community centers, shopping centers, libraries and fire stations that use our recycled water. "All told the county annually distributes 1.3 billion gallons of recycled wastewater across all three island for reuse in some form or another. That's around 3.5 million gallons reused daily. "While that is a lot of recycled wastewater, it's less than 30 percent of the wastewater treated at county facilities daily. In order to use more water, we must get aggressive and find more alternate uses. So far we've spent $94 million on our wastewater treatment facilities to better clean our water so that it can be used for irrigation purposes. "These expenditures include feasibility studies, construction of distribution systems as well as treatment upgrades and modifications to UV and filter systems. "When the county's wastewater reclamation facilities were built in the 1970's, disposal of excess recycled water in deep injection wells was advocated as a much more environmentally sustainable practice than dumping raw sewage through open ocean outfalls, taking advantage of the earth's natural filtration of groundwater as it moves seaward. "Today, the county is again at the forefront of water reuse advocacy. We have many projects in the works in almost every district and they are progressing steadily. "Reuse projects include another million gallon storage tank in Kihei and the development of a forest reserve/plant nursery/passive park in South Maui by the new police station. This should use all of the water currently going into the Kihei injection wells. If we need to reuse more water we will work with Haleakala Ranch to expand irrigation into the pastures surrounding the project. "In Lahaina we plan to utilize high-level reservoirs that can pump and store recycled water so we can redistribute and reuse it all. We can accomplish this in about a year. "In Central Maui we are coordinating with the State Department of Transportation, Airports Division, to provide them with recycled water. This includes a renewable power generation project near Kahului Airport that will use 500 acres of biocrop as a feed source. This could utilize up to 4 million gallons of recycled water daily from the Kahului Wastewater Reclamation Facility. "This should essentially eliminate the daily use of the Kahului injection wells within a year. The project will hopefully be functional this year. "The county is also investigating the use of soil aquifer treatment basins as an advanced and environmentally sound means of disposing of any excess recycled water. "In Molokai, we are working with landowners near the Kaunakakai Wastewater Reclamation Facility on the potential for land application for the recycled water for agricultural irrigation use. "This change in philosophy is not inexpensive. "When all is said and done the county will have spent more than $100 million in capital costs plus many millions in annual operational and land acquisition costs in order to more fully utilize recycled water. This will make increases for sewer user and recycled water user fees necessary for the future. "However, once we bear this financial liability, instead of injecting unused recycled water into wells it will be used to help keep our county green and beautiful. "The alternative is to implement deep ocean outfalls like Oahu, which is essentially dumping good, reusable water into the ocean. This is not a solution to which we subscribe."